I love the simplicity of this one-pot macaroni and cheese; however, after 20 hours in the car with Kiddo (who, by the way, was a car-traveling champ) in the last four days I wasn’t really feeling the urge to watch the pot as closely as I would need to in order to avoid a boiled-over-milk scene on the stove. I also had some pimentos that had ripened in the garden while Kiddo and I were gone. So I crossed my fingers and totally made up tried this — and it worked! Holy cow, I want that right now! Oh so yummy! And I didn’t know you could grow pimentos so easily! I think I may have to try that. 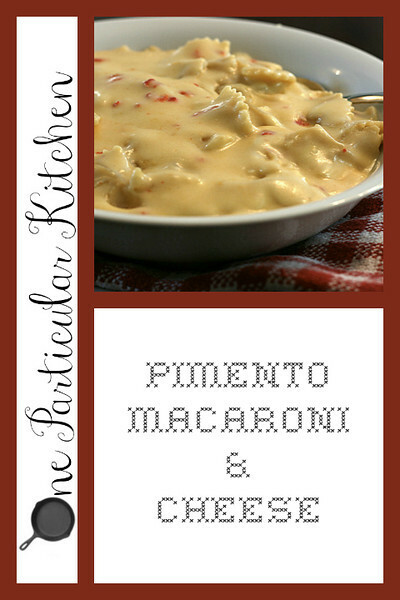 I love throwing in tomatoes in my mac and cheese, so this would be a great “red” alternative! I love that I can put the dry pasta right in, so easy! Can’t wait to give this a try. Yum! Gotta try this, mom son is a mac n cheese freak and we enjoy making new mac n cheese recipes together. Thanks for posting this!! For what it’s worth I really think you need to do this.